Mustard seeds are the small round seeds of various mustard plants. The seeds are usually about 1 or 2 mm in diameter. Mustard seeds may be colored from yellowish white to black. They are important spices in many regional foods. The seeds can come from three different plants: black mustard, brown Indian mustard, and white mustard. Mustard seeds generally take three to ten days to germinate if placed under the proper conditions, which include a cold atmosphere and relatively moist soil. Mature mustard plants grow into shrubs. Mustard grows well in temperate regions. Major producers of mustard seeds include Canada, Hungary, Great Britain, India, Pakistan and the United States. 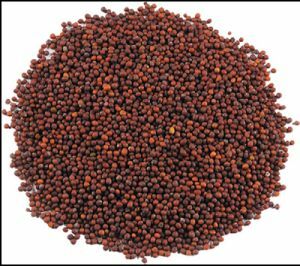 Brown and black mustard seeds return higher yields than their yellow counterparts. Mustard seed is a rich source of oil and protein. The seed has oil as high as 46-48 percent, whole seed meal has 43.6 percent protein. Mustard seeds are good source of selenium, which is known for its antiinflammatory effects. Selenium is nutrient that helps in reducing the severity of asthma, certain symptoms of rheumatoid arthritis and even cancer. The oil extract from mustard seeds has an incredible property of lowering high blood pressure. Mustards seed and mustard oil also helps prevent heart attacks and diabetic, thus making it the most preferred oil. Mustard seeds have proven to be hopeful in reducing the frequency of migraine attacks. Consuming these is known to help women suffering from distorted. Mustard seed contain a lot of phytonutrients called glucosinolates. They also boast of myrosinase enzymes, which can break glucosinolate into other phytonutrients called isothiocyanates, known to have anti-cancer properties. The seeds prove to be a good source of omega-3 fatty acids, iron, manganese, zinc, protein, calcium, dietary fibre and niacin. Mustard seeds are a good source of magnesium, which help reduce the Severity of asthma, lower blood pressure and prevent heart attacks in patience. Suffering from arteriosclerosis or diabetic, heart disease. The magnesium in mustard seeds also help in sleeping up metabolism of the body, hence improving digestion. Mustard seeds are known to have antibacterial, antiseptic as well as anti fungal properties. Consuming mustard seeds can help people with lack of appetite, when taken with milk, 15 minutes before the meal. Massaging your scalp with mustard oil will help you to substantially improve your hair quality and prevent the hair loss.